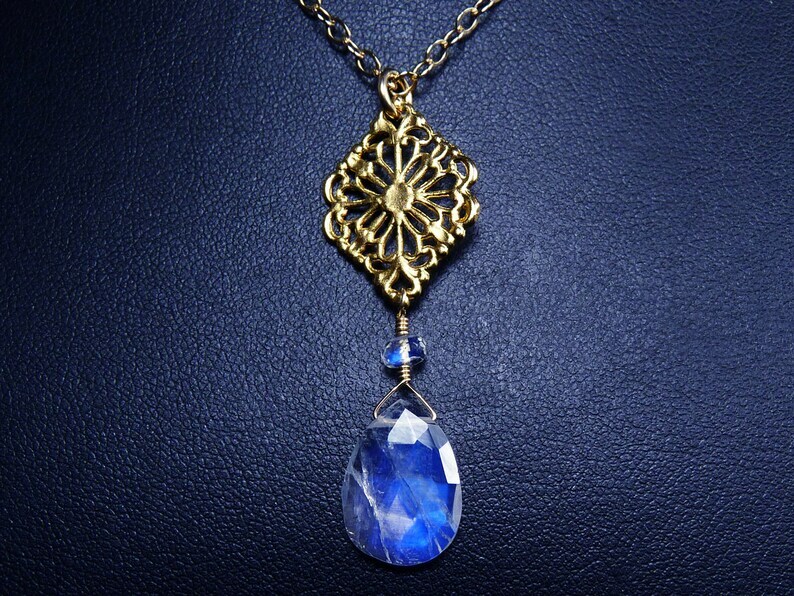 AAAA, intense blue fire, rainbow moonstone and gold filigree pendant necklace. A beautifully faceted, AAAA, translucent, rainbow moonstone teardrop glows with intense and vibrant cobalt blue fire from many different angles as it catches the light. The gemstone is wrapped with 14K gold filled wire below a AAAA, sparkling, microfaceted, rainbow moonstone rondelle with bright blue fire and a vermeil (gold-plated sterling silver) filigree pendant with a matte gold finish. Like all the rainbow moonstone jewelry in my Etsy shop, these are natural and untreated gemstones. The rainbow moonstone teardrop measures 15mm x 11mm x 4mm (9/16" x 7/16" x 3/16"), and the rondelle is 4mm. The filigree pendant is 21mm x 15mm (13/16" x 5/8"), it is suspended from a 14K gold filled ring, and the entire gold and gemstone pendant dangles 47mm (1 7/8") from a 14K gold filled chain that fastens securely with a 14K gold filled lobster claw clasp. The necklace is shown with a 17" chain in the photographs. This rainbow moonstone pendant necklace flashes and glows with spectacular blue fire!